GiveWell ranks AMF #1 for fifth time in six years! AMF has signed an agreement with partners in Papua New Guinea to fund 1.2 million nets for distribution in 2017 and has committed to fund 1.6 million nets to be distributed in 2018. This represents 100% of PNG’s long-lasting insecticide treated net (LLIN) need for 2017 and 2018. The nets will be distributed in a rolling universal coverage campaign – one third of the country is covered each year, which optimizes the teams and other resources used to carry out the distributions and is designed to suit the challenging and widespread PNG geography. The 2017 nets will be distributed between March and December 2017. In total, 5.6 million people will be protected. Malaria is one of the primary health issues in PNG, with high incidence levels seen across the country. These nets have the potential to play a major part in reducing deaths and illness. AMF allocates individual donations to specific distributions and so far we have allocated 3,427 individual donations from 1,321 donors from 35 countries. These figures will increase as further donations are allocated. Many donations, large and small, help fund these nets. Our distribution partner in PNG, The Rotary Club of Port Moresby (RCPM) has demonstrated a strong attitude to accountability and this is reflected in our agreement. 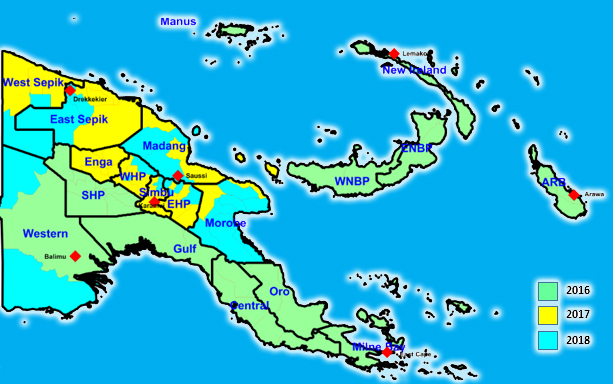 RCPM has been responsible for carrying out the universal coverage distributions in PNG for the last five years. We are grateful to the RCPM for the open, efficient and transparent nature of our discussions. We will report openly on progress and performance throughout the distribution. '105%' data collection will be used for the pre-distribution household-level registration process to support accurate data gathering. Household-level data will be put in electronic form using AMF’s Data Entry System (DES). This, and the above element combined, are the basis for a highly accountable distribution. Post-distribution check-ups of net use and condition (PDCUs) will take place every six months for two and a half years in all districts. AMF will fund this. Note: We have signed the agreement for the nets to be distributed in 2017. We have not signed the agreement for the 2018 nets as this will take place in the first part of next year when other partners receive formal notification of the relevant funds allocation.